The dead hold an incredibly high importance in Hellenism. The ancestors are of high importance and certain rites that must be performed for the deceased to be rightly honoured as they move on from one life to the next. However, bodies themselves must be kept care of in a particular way, since if they are mishandled miasma (spiritual pollution), which causes contamination and ill omen, may spread and cause heavy spiritual damage. With all the reasons for why they should be forbade by day, we finally get to a justification for why they should be at night. Simply said, death is rest, and night harmonizes with rest. The Sun, King Helios, is responsible for day, night, winter, and summer through His departure and arrival; and is also the source from which all things proceed from. As such, He has appointed rulers over the living and allotted lords over the dead, and in turn, we ought to assign to both of these classes what is fitting for them, and to imitate in our daily life the orderly arrangement of the Gods in things which exist. From here, we see night hours are the hours of the Gods of the underworld (who are the guardians and lords of souls led by Lord Serapis), and thus burials should be assigned to the times appropriate to these Gods. The pure day is to be consecrated to pure deeds and the pure Gods of Olympus. Further, we see that those who were thoroughly versed and punctilious in sacred rites would have the knowledge of it being best to perform rites of the underworld Gods at night, and some even going to far as to state that rites to the underworld Gods should only be performed after the tenth hour of the night. Thus, if this is the best time for the worship of the Gods of the underworld, then it is certainly the best time for the service of the dead, and no burial should take place earlier than the tenth hour of the night. Night time has the added benefit of not many people being up and about then, and thus miasma is mostly contained to the grieving family. Burials should not take place during the daytime. This is because it is bad luck to see a corpse during daylight hours, as the decay of the corpse, in contrast to the light of the Gods, contaminates bystanders with miasma. This contamination can cause religious pollution which brings blindness to the light of the Gods. Thus, it is impious to bury the deceased at day. A temple is a sacred place dedicated to the Gods, and thus is a place that is intended to be as pure as possible as a means of getting us as close to the divine as possible. Corpses, however, spread Miasma (spiritual pollution) and contaminate. This is why those who have contaminated themselves also should not enter religious institutions until they have cleansed themselves from the pollution, as not to spread it. Sacred precincts and temples of the Gods are often lain open; someone usually doing rites of sacrifice, pouring libations, or even praying. This all ends up disturbed when people carrying a corpse are passing close by the temple, with the religious pollution carrying into the temples and even making these holiest of sites polluted. Imagine people going about their own business. All the streets are full of people going to the law courts, to or from the market, sitting at work doing their crafts, or visiting the temples to confirm the good hopes that the Gods have vouchsafed. And then some person, causing an inexcusable act of public indecency, transports a corpse throughout this crowd. Not only is it a disruption of the daily activities of those who don’t wish to see and be disgusted at the sight, but it also spreads miasma. This is, in every way, intolerable. When a person dies, their body is to stripped, cleaned, washed by the women of the house (pardon those who are pregnant) with seawater, and anointed with oil. Following this they are to be laid out on a couch and dressed in their finest clothing. A coin is to be placed in their mouth, under the tongue, or on their eyes. This tradition is done in relation to Myth & Ritual; so that they may pay the ferryman Charon to row them to the land of the dead. After being laid out for 8 days, they may then be taken out for their burial. During a funeral, either white or dark clothing should be worn for mourning. Funerals are to take place at night, only after the tenth hour of the day and before sunrise, by torchlight. It is also preferable to be held outside the confines of a city, as a means of not spreading miasma. The corpse is to be carried with the feet foremost on an open bier covered with the finest cloth and carried by the closest relatives and friends of the deceased. The funeral procession is preceded by the image of the deceased, together with those of their ancestors. The funeral procession may be attended by musicians. In front of the corpse, representatives of the ancestors of the deceased walked wearing wax-made ancestral imagines, or funerary masks, in the likeness of the deceased’s ancestors. Behind all of this, the family of the deceased may follow. A eulogy, a formal oration in praise of the dead, is to be read during the procession, but may also be done after the funeral. It is also preferable for burials to take place outside the confines of a city, as a means of not spreading miasma. After the procession, the body is to be placed inside a coffin, called a sarcophagus, which is often massive and richly decorated. It is recommended for a picture to be placed at the front of the sarcophagus as a reminder of what the person looked like in life. Cremation, though a less preferred practice, is one that may be done. In the event of cremation, a funeral pile is to be constructed in the shape of an altar and the body laid on it. It is then burned, and perfumes and spices are to be thrown into the blaze. Other objects that were held dear and might be of use to the dead in the afterlife are also thrown in. Once the flames have consumed the corpse, the embers are to be quenched with milk and wine as a means of “feeding the dead”, and the ashes and remaining fragments of bones and teeth are deposited in a funerary urn, which is to be kept in a mausoleum (as it is forbidden to bring an urn home, due to the spread of miasma). At the conclusion of the procession and the ceremony, the sepulcher may be strewn with red flowers, and the mourners may give a last farewell of the remains of the deceased. Water is to be thrown upon the mourners by a priest to purify them from miasma. For nine days following cremation, family members should continue to set themselves apart from the rest of the community. During this period, offerings of food and drink may be offered to the dead together with sacrifices and the grave is to be formally consecrated. Festivals should be held for prominent members of the family. After the burial, the family should stay in mourning for a month. During this time, due to ritual pollution due to exposure to the underworld through the deceased, they should not partake in festivals, offerings to the Gods, or visiting temples. They should, however, frequent the grave or tomb often, and present the dead with khoes (libations to the deceased), and a burnt sacrifice of cakes, fruits and wine. Parentalia, which takes place February 13 to 21. Literally “Ancestors Days” or “Days of the Ancestors”, Parentalia is the February festival celebrating the deceased ancestors of the family and the paterfamilias. They are offered red flowers, wine-soaked bread, violets salt, and wheat. Often they are providing a true sacrificial banquet, but these are di inferni, spirits of the underworld. They are those who dwell below, and proper care must be made in sacrificing to them. Hellenes grieving for non-Hellenes are still able to perform some rites in memory of them. Many modern funerals bear a strong resemblance to the customs of Hellenes; the body washed and cleaned, laid out to be visited. Hellenes are encouraged to show grief during the funeral. Frequently in modern funerals there is always a location where the deceased may be visited such as a grave, a field where the ashes are strewn out, or an urn. There are some funeral homes which allow family members to help with washing and dressing of the deceased, which is encouraged to do. If you are being the one prepared by non-Hellenes, you may make a will where you may request anything you want; including the inclusion of a coin. At home, when not actively involved in the funerary rites, you can still do rites to honour the deceased. Make the khoe to Hermes Khthonios, and present Him with coin(s) for the dead. Tell Him that you will pay for their passage, should they need it, and pray that He and Kharon will accept. Grieve loudly, especially if you are a female. Recite stories of the deceased, and make sure they will never be forgotten. After the funeral or cremation, cleanse yourself and the house thoroughly as a means of removing any pollution. One thing Hellenes are forbidden to do are bring the ashes of their deceased loved ones into their home, as this would permanently pollute the house. Alchin, Linda. Roman Funerals. 2017. Accessed July 16, 2017. http://www.tribunesandtriumphs.org/roman-life/roman-funerals.htm. Flavius Claudius Iulianus Augustus. Julian the Apostate, Letters (1923) Works vol. 3, pp.2-235. Accessed July 16, 2017. http://www.tertullian.org/fathers/julian_apostate_letters_1_trans.htm. Libanius. Libanius, “Julian the Emperor” (1888). Monody: Funeral Oration for Julian. Accessed July 16, 2017. http://www.tertullian.org/fathers/libanius_monody.htm. Fife, Steven. 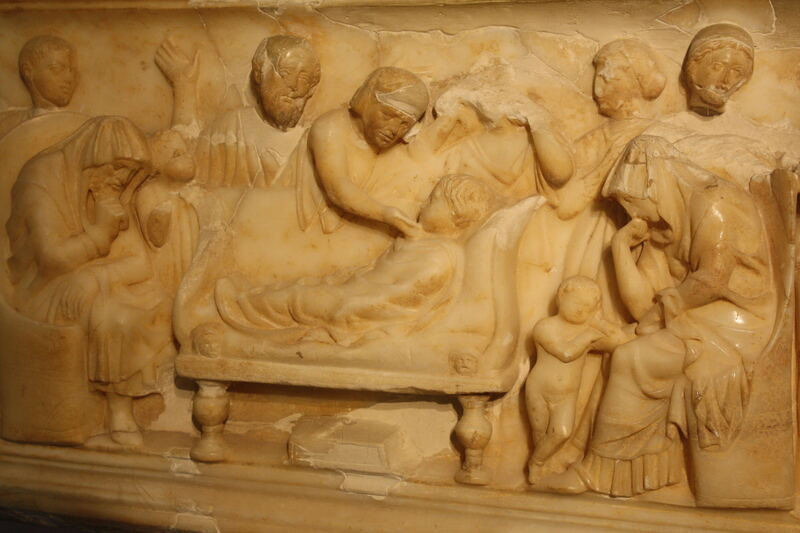 “The Roman Funeral.” Ancient History Encyclopedia. Accessed July 16, 2017. http://www.ancient.eu/article/96/. Gill, N.S. “How Did the Romans Bury or Cremate Their Dead?” ThoughtCo. February 10, 2017. Accessed July 16, 2017. https://www.thoughtco.com/roman-burial-practices-117935. Rienties, Mayra. “Baring the Aegis.” PBP: The Hellenic Underworld and afterlife. October 19, 2012. Accessed July 16, 2017. http://baringtheaegis.blogspot.ca/2012/10/pbp-hellenic-underworld-and-afterlife.html. “Roman funeral rituals and social status: the Amiternum tomb and the tomb of the Haterii.” Khan Academy. Accessed July 16, 2017. https://www.khanacademy.org/humanities/ancient-art-civilizations/roman/beginners-guide-rome/a/roman-funeral-rituals-and-social-status-the-amiternum-tomb-and-the-tomb-of-the-haterii. Temperance, Elani. “Baring the Aegis.” Ancient Hellenic funerary rites and their modern interpretation. February 26, 2013. Accessed July 16, 2017. http://baringtheaegis.blogspot.ca/2013/02/ancient-hellenic-funerary-rites-and.html.